Our currency advent calendar gives you a guaranteed best rate for some of the most popular currencies in the world. Simply visit Rates, find the currency you need and save the date. Then, on the day advertised, we guarantee to give you the best rate going around. Just think what an extra stash of Thai baht or Japanese yen will get you on your holiday! 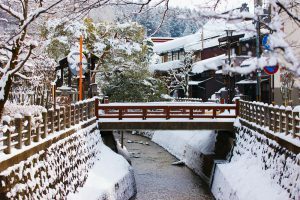 Meantime, if you’re heading to the UK, Japan, Hong Kong, Canada or Thailand these holidays, check out our ideas for a very merry (non) Christmas. 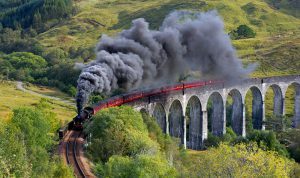 Spend a leisurely week travelling the trains that chug slowly northwards into Scotland. While away hours gazing out the window at the windswept landscape. Or hop off when the whim takes you to explore quaint villages covered in a dusting of snow, where the warm and welcoming lights of the local pub pull you in for a pint. As you get further north, many of the smaller villages won’t have easy access to banks – particularly during the festive season – so it pays to stock up on pound sterling. This way, when you order a pint of lager, you’ve got a way to pay for it. Top tip: Put Friday, 8 December in your diary as the day to grab our guaranteed best rate on GBP. Heading to Japan for the festive season? For a memorable day-trip or overnighter from Tokyo, head to Hakone or Takayama to soak it up in an onsen. These traditional Japanese hot baths will melt your stresses away, and are the perfect antidote to the cold weather outside. Both cities exude old-world charm, and the views of Mt Fuji rising up in the distance are sure to inspire. As the year draws to a close, remember that many places in Japan shut down over New Year. Do as the locals do, and visit a shrine at midnight on New Year’s Eve. Feast on glutinous rice balls, long noodles and other festive foods. But remember, Japan is a cash society at the best of times – none more so than shogatsu, or New Year. Carrying plenty of cash is a must-do. Put Monday, 11 December in your diary to grab our guaranteed best rate on JPY. 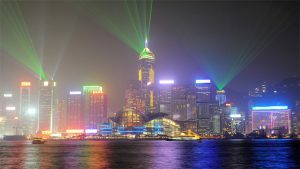 A trip to Hong Kong in December is all about the lights. The annual Symphony of Lights puts the Griswold’s Christmas lights to shame. Recognised as one of the world’s most spectacular night shows, the show runs until 28 December. Head to the harbour to witness the transformation of buildings around you into a mindblowing multimedia extravaganza. Hong Kong’s infamous street food is the perfect fare when wandering the streets at night. Try cheung fun or stinky tofu, fish balls or egg waffles. These delicious treats redefine ‘cheap eats’ – just remember to carry a stash of Hong Kong dollars with you so that you can chow down whenever your tummy rumbles. Top tip: Put Tuesday, 12 December in your diary to grab our guaranteed best rate on HKD. So you’re escaping an Aussie Christmas. Doesn’t mean you can’t enjoy a few festivities abroad! The Vancouver Christmas Markets are a feast for the senses. Sublimely situated on the seaside, it’s a place to indulge in decadent treats. Think German sausages, warming Glühwein or apple cider, a dazzling array of sweet delights and much more. It’s open right up until Christmas Eve. 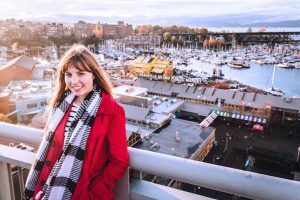 For more market merriment, catch the Aquabus to Granville Island for a day spent browsing the famous Granville Island Public Market. This massive undercover space is ideal when the weather barely rises above zero outside, with a huge array of market stalls to tempt you. Just remember to carry plenty of Canadian dollars with you. It’s so much easier to sample the many delights of a market when you can hand over a crisp banknote! Top tip: Put Wednesday, 13 December in your diary to grab our guaranteed best rate on CAD. If your idea of the perfect Christmas is getting away from it all, then Ko Kut is your go-to in Thailand. This exquisite piece of paradise is the epitome of island life – hammocks strung between palm trees at the edges of white sandy beaches, turquoise waters and blissfully low numbers of tourists compared to neighbouring Ko Chang. Hop on a tuk-tuk to explore the island or book a boat ride to a coral reef for a spot of snorkelling. 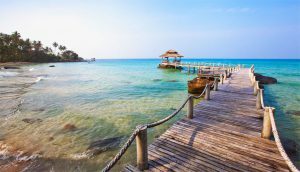 Given its remoteness, you’ll likely need some Thai baht to pay for these oh-so-taxing holiday activities. Top tip: Put Thursday, 14 December in your diary to grab our guaranteed best rate on THB. Wherever you choose to spend your holidays, grab the best deal on the currency you need with WeXchange. Head to Advent Rates now to save the date for when we’re offering best in market rates for the currency you need.